The last trimester of 2012 marked the onset of the rainy season as predicted. In Cangandala and Luando, the rains started early and heavy this season, somewhat compensating for the severe drought that lasted for almost one year. We had several good developments in Cangandala. Firstly, and quite unexpectedly, old Duarte not only survived but made a sensational recovery. Only a few weeks after we had left him in shocking condition, we found him in great shape and looking after his girls. I must confess that I had been very pessimistic about his future, and I was quite convinced that he stand little chance of making it through the turn of the year. Fortunately I was completely wrong on this one! He no longer is limping markedly, seems to keep well the pace with the herd, looks alert and in good condition; the fur recovered the old shine and, quite remarkably, the ticks are now almost completely gone. Quite amazing how fast the ticks spread and took over his skin when he was beaten and ill, and how quickly they disappeared as soon as he got better… it’s as if ticks sense when an animal is debilitated, and/or somehow a healthy animal has the ability to repel most ticks and keep them under control. But if ticks were under control, the tsetse flies were a nightmare, probably affecting all living mammals in the region, us included! 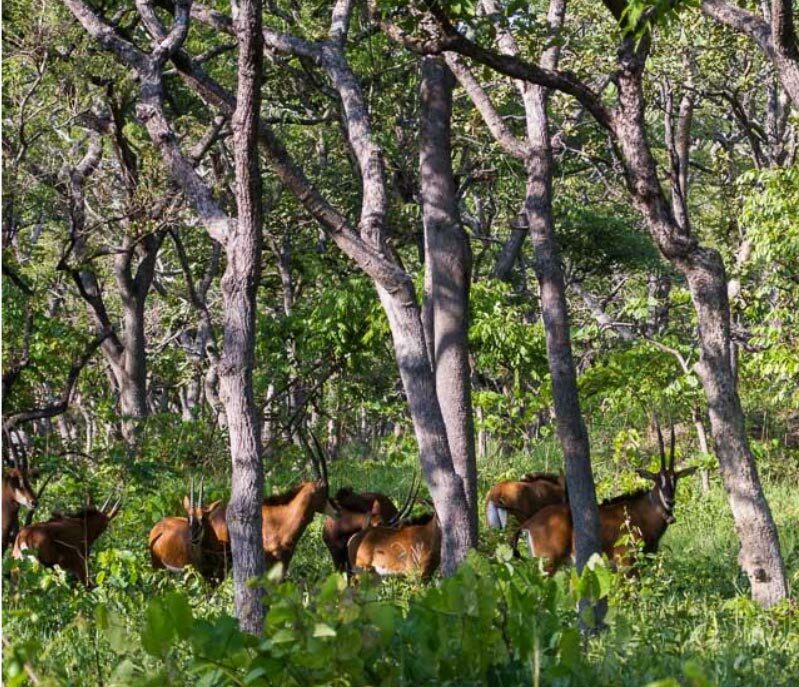 This was not necessarily surprise, as every year after the first big set of rains, and for about a couple months until the woodland gets too wet even for them, the flies explode in numbers and come down hard mainly targeting the large social antelopes. I have the distinct feeling (I feel it in my veins) that this has become worse every year, which is probably a good sign… more sable mean more tsetse flies! 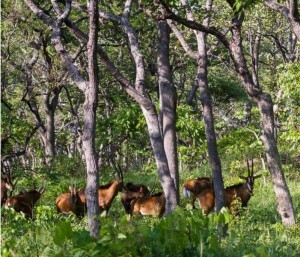 To procure some relief from the relentless flies, every 15-20 minutes the sable herd would suddenly run for a couple hundred meters before resume grazing. It also seemed that the bulls were the most affected by flies (possibly attracted to the dark coloration), and in response they would sit down often inside thick bush. At the end October the animals had temporarily split in two groups: the old females stayed with the hybrids, while the new females and young were joined by the bulls in a second herd. This worked very well in our favor, as the crazy hybrids are always nervous and almost impossible to approach. Therefore, we focused on the second group and were able to approach the animals several days, providing us not only to monitor closely the most important group, but also to get by far the best photographic sequences to date! And most importantly, breeding turned out to be better than anticipated. It turns out that all the three young females brought in from Luando in 2011 at age 2, produced one calf each. This brings the total calves produced in 2012 to 5, but it is possible that the old champion breeder Teresa, may have calved again before end of the year (she could not be located). But at least we had 5 calves, of which 3 are females. It was a pleasure to keep track of this prime herd, with several young beautiful girls, and many calves around. In addition, Duarte’s successions seems to be guaranteed and in smooth fashion, as both Mercury and Apolo are growing up fast and strong, and so far are well integrated and tolerated by Duarte. They all seem to know their role and position within the hierarchy…But of course boys will be boys, and sooner or later, the youngest should get expelled. Looking back, the first two years after the breeding program started have been very disappointing, and the breeding frustratingly slow. But now finally things are looking brighter, and for next year we expect an even better breeding performance, as we have now four other females which have just turned 2 year old, and could deliver their first calf in 2013. With two remarkable exceptions (Teresa and Luisa) the old Cangandala females haven’t been up to the challenge, and if it wasn’t for the 2011 operation bringing to the pot 6 new females from Luando, the giant sable population in Cangandala would not have survived! Now, at least we have a chance. The trap cameras gave us plenty of duiker, bushbuck and warthogs as usual and some roan, but the biggest surprise was a young male waterbuck, quite close to the fence line. These were known from the riverine floodplains in the south, and it was the first time recorded in the heart of the park. Also interesting were a few nocturnal sequences showing us a greater gaçlago and a white-tailed mongoose. 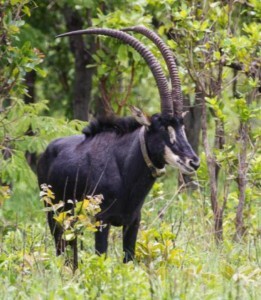 If things went smoothly in Cangandala, it was however very different in Luando where poaching seems to be rampant, and we were faced with a number of shocking cases to illustrate this, in spite of the desperate efforts from the rangers – the giant sable shepherds. Two shepherds on patrol were shot at by poachers (fortunately the poachers missed and no one got injured) and on a second occasion managed to apprehend a rifle, as the poacher escaped and left the weapon behind. Plenty of snare traps are being found and dismantled on a regular basis, but arguably the most shocking incident was when, during a routine patrol, the shepherds found a dead body of a freshly killed giant sable bull. The carcass was getting rotten, but still showed a round bullet on the neck. With support from the Angolan Air Force we scooped the area on the following day after the incident was recorded, without relevant results, and only a couple weeks later we were able to make a ground expedition to the site, to gather additional information. It was a young healthy bull, at the prime of his life, and had no signs of infection or bone injuries, practically ruling out a snare injury or disease. The most likely scenario points to bull getting away after being shot in the neck by poachers. Compared to a few years ago, we now have a much better understanding of what is happening in Luando. We also have a basic monitoring network on the ground which is producing promising results, and some small steps are being implemented directly against these illegal activities. But we are still far away from tackling the crisis properly and reverse the trend. 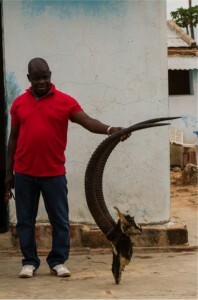 The situation is quite alarming, but I want to believe that 2013 will be year of change, when the table odds will be finally turned against the poachers and in the giant sable’s favor!